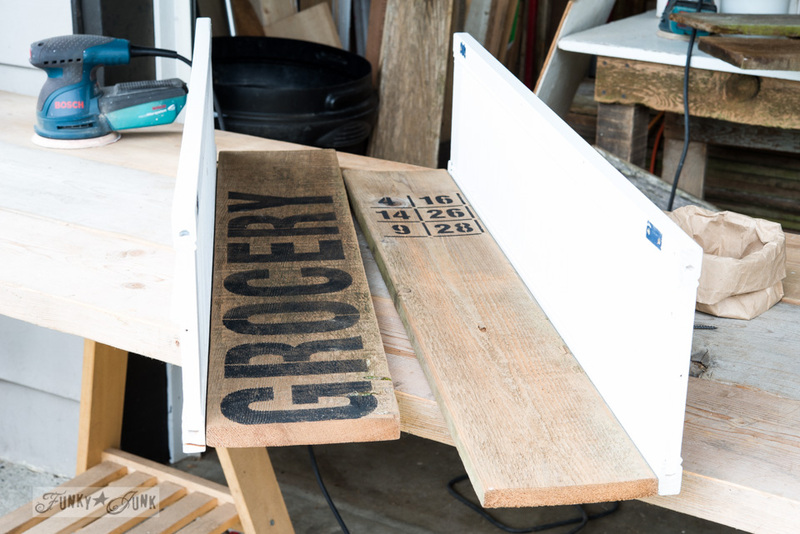 If loving the home I have has anything to do with new creations that refresh old spaces, like this old sign shutter shelf, I am well on my way! Last week, I had a jolt. I went for a walk, and to my surprise, a dream farm I have long coveted over was wearing that annoying enticing FOR SALE SIGN once again. You can read “Dream Farm, we need to chat” HERE. But, good ‘ol common sense told me owning my own farm was too much for me to carry alone as is. Expense and work wise. I’ve owned a farm before, so I know exactly what that entailed. I’ll tell that story soon. So upon coming home, I slumped into my chair, and wondered how on earth I could become more content with my OWN home, so my eye didn’t wander so easily. Once home, I remembered I had some reading to do. Melissa from The Inspired Room, wrote a book on this very subject, Love The Home You Have… and I hadn’t even cracked open the cover yet. Add therapist to your list of achievements, Melissa… I promptly sat my pouty self down with a fresh coffee, and dug in. As I read, I sank lower into my chair. Melissa started off describing her homes. From one to the next, she kept moving. Always looking for ‘the one’. But each time she moved, while she gained in some areas, she lost in others. With every home I’ve had, there’s always been a trade off of some sort. I mean, I love the location of my home. The mountain view back yard. The neighbourhood. I really couldn’t take care for a larger yard myself. I’m set up well for retirement RIGHT where I am. So WHY can’t I just be content? I admit, some tradeoffs, such as a little more land and storage space would be nice. I do think our needs change over time. But I’ve come to a bigger realization after a little more reading. I had to really define the main reason WHY I didn’t love my current home. Well… it’s a tiny bit more than that. I live in what’s fondly called a BC box. The shape of my home is a rectangle, with the main living upstairs. Which looks and works nothing like the farmhouse ground floor wrap around porch style I love so much. Over the years, I’ve been transforming the style of my home INSIDE. One big nod towards my upcycled look was painting my stairway to resemble old crates. I carried on with MANY smaller projects too. But the big standing ovation moment was when I was challenged to blend my salvaged junk ways with a brand new modern bathroom vanity. I went all out. I planked a ceiling for the first time myself… I did a crazy neat attic wall treatment… invented a way to make my own farmhouse window with plain planks… and more. 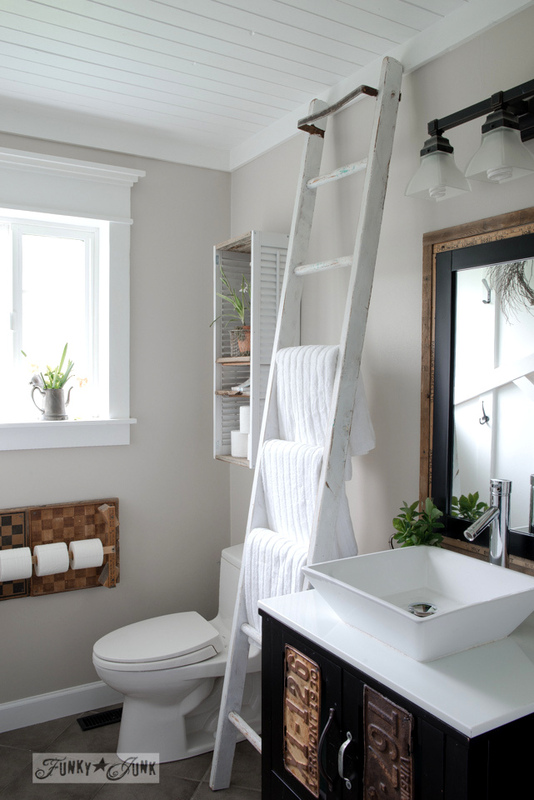 When I finished the bathroom , I stood back in awe… I had captured the EXACT style I was after. And realized I could make it happen to the rest of this square box of a home I didn’t love. I had forgotten a mantra I made for myself. 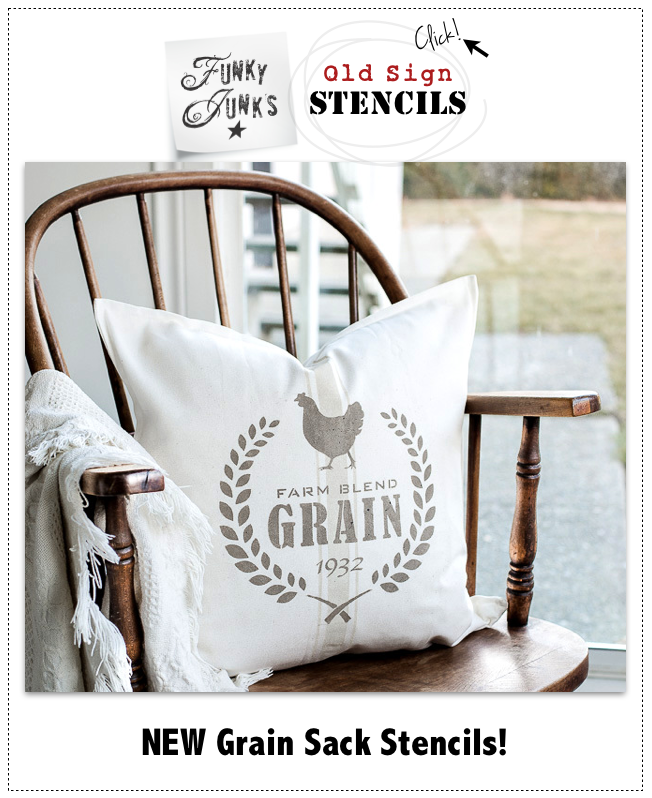 I was going to show how anyone could transform their ‘outdated home’ into a farmhouse style they absolutely love. So it’s now officially back on my list! I’m moving forward with this one, every chance I get. Through big projects and small. Not sure where to even start with all this yourself? In the back of Melissa’s book, I was encouraged to select one of her 31 Day Challenges. They are small, easy tips that can instantly change the way you feel about your own home. 1. 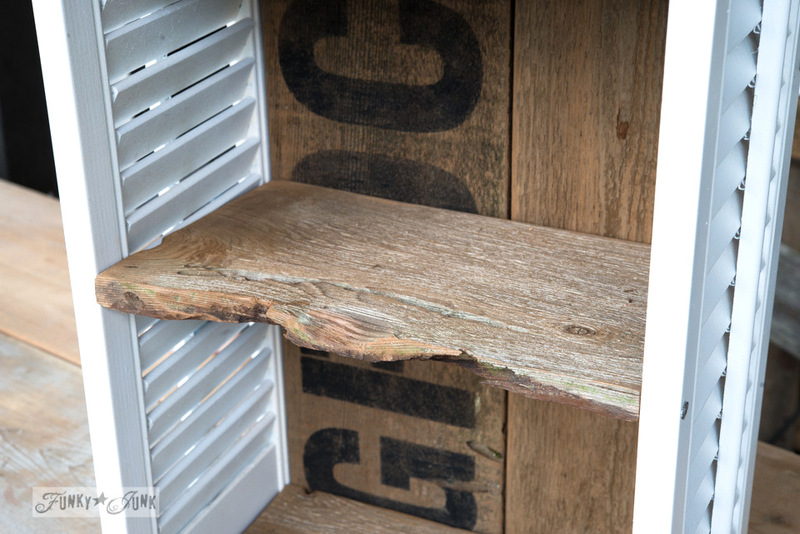 Clean your reclaimed wood well and allow to fully dry. For me that meant to pressure wash mildew off the fence panels. A scrub brush with bleach and water may work well too, but I like pushing the easy button now and then. 3. Cut two planks down to the same height as the shutters. 4. 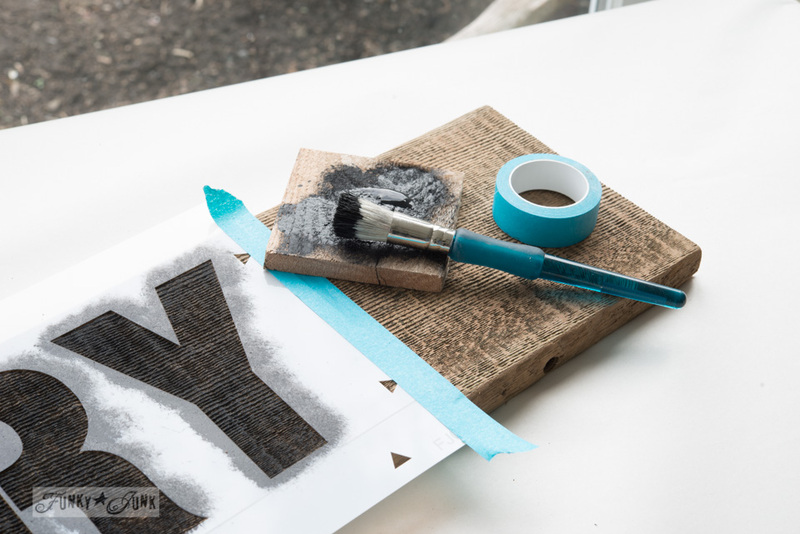 Stencil your planks in a random way so they resemble an old sign cut down to desired size. I use lots of quirk with placement. 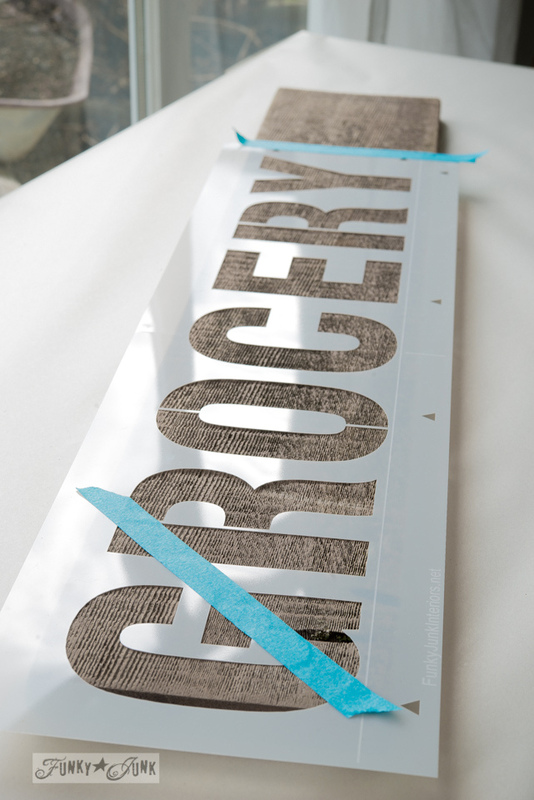 Note the G is cut off in GROCERY and only a small portion of the BINGO large stencil was used. 5. Attach shutters to the two planks as shown. Predrill pilot holes, then attach the shutters to the planks with screws from the sides. 6. Attach the two planks together on the front with old hinges. Here’s where quirk reins. 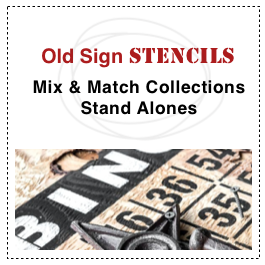 Use OLD authentic ones, so your work looks old! 7. Cut a top and bottom shelf to fit the width of your shelf. 8. Create adjustable shelf supports. 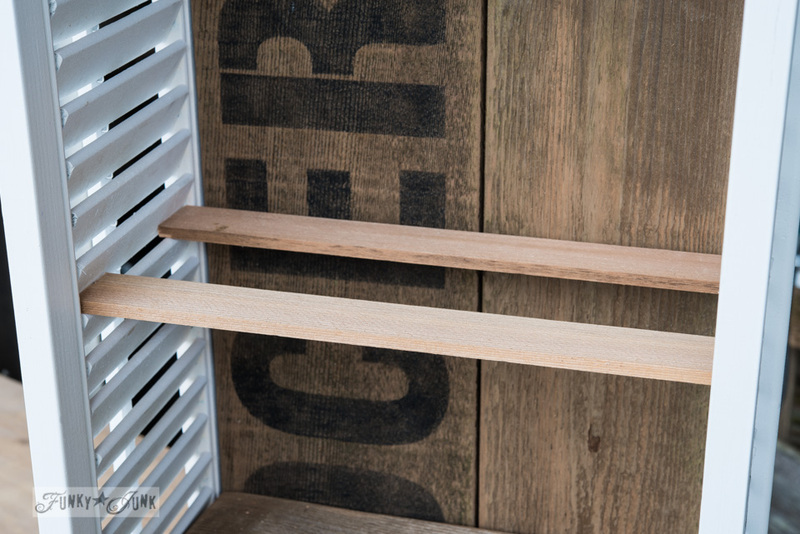 Cut small cedar slats to size, then slip into place, supported by the shutter slats. 9. Place shelves on supports. Cut down fence planks to size, then place on top of your supports. Create more interest, by showcasing natural curvy wood shapes towards the fronts of your shelves. Note: screw the shelves into the sides of the shutters for permanent placement if preferred. I’m even MORE in love with my salvaged farmhouse bathroom now! I realize this little shelf in itself hasn’t turned my box of a home into my dream home. But over time, I’m finding that wherever I make the effort to inject MY style into my home, I’m getting a little closer each day. And even if this isn’t my forever home, (I still desire a tiny bit more land and a barn.. I don’t want much… 🙂 ) maybe the changes I make will help it sell for more down the road anyway. Thanks for the timely words, Melissa. I think taking the time to define WHY one doesn’t love their current home is time well spent. Whether it’s due to clutter, lack of space or style, you may wish to further investigate ways you can make the home you have work for you. It’s a LOT cheaper than moving! Buy Love the Home you Have HERE to get started on your own 31 day challenge! 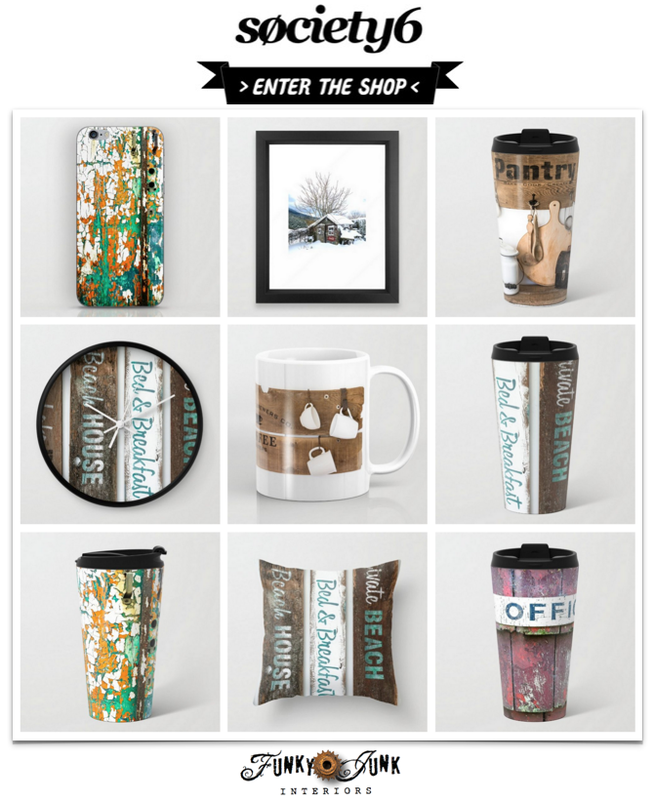 Love Your Home Challenge HERE! Or click direct below. Some links may not be live first thing in the AM. I moved into my current house when the housing market was insanely expensive. It is an old house, over 150 years old, which I love, but a house that old comes with its own problems, like a teeny, tiny bathroom. I can deal with all those things, though sometimes, lack of money to fix is maddening. I gave up a wonderfully, woodland location where nature was right there. I do miss that, though I don’t miss deer eating my flowers, sorry. The worse thing is the fact that on one side, I have some awful neighbors that abut my property. I have no privacy. They are rude slobs. It wears me down. Even putting in a fence is tough, sine I don’t have much land. Any ideas for temporary fixes? I have thought hard about ways to gain some privacy…If only the great neighbors on the OTHER side shared the space. Wonder if I can get them to switch? You and melissa are so right on! I don’t even have a home! I never owned one of my own. I have lived in small , medium, and large apartments called three deckers since I left home at an early age. I was always afraid of owning a home, and now that I am almost retired, i want a small cottage somewhere that I can garden and do projects exactly like this one. However, i am always changing up the schemes and themes of my space, a little apartment Il I’ve in now, and am inspired by your blog. I change colors by making new pillow covers, and table runners, curtains, and by making homemade beautiful “moonlights” out of old lace, or decorate everything to make things look bigger and spacious. Your blog helps fuel my creativity, and I love this shelf idea, as I am looking to replace a shelf but have not found anything out there that I like. 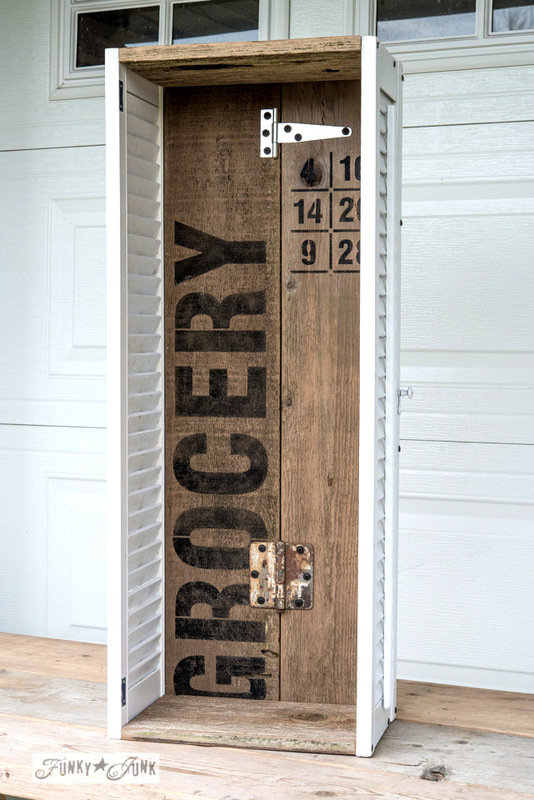 I am a little shabby chic, a little but rustic, so this is purrfect! Love you gals! 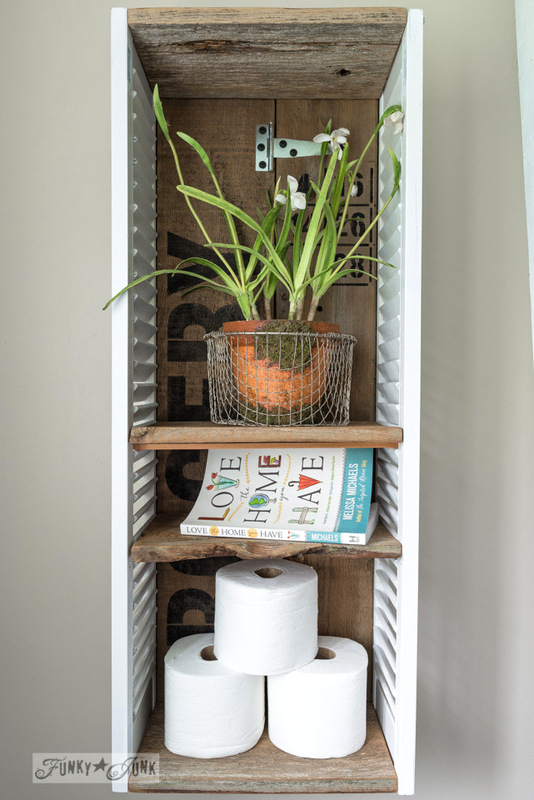 I love your funky and oh-so-creative shelf. 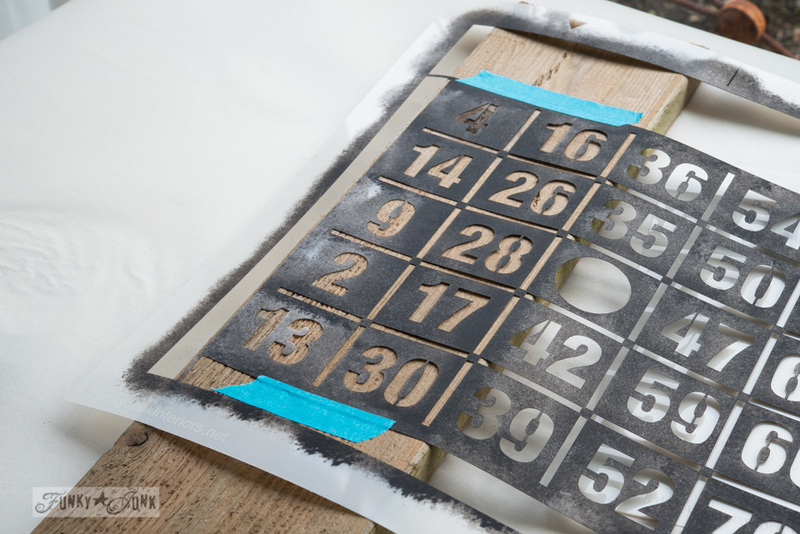 The raw edges of the wood, the old shutters, hardware, and your fabulous stencils are the perfect ingredients!! It’s all the little things that add up and have such a huge impact. 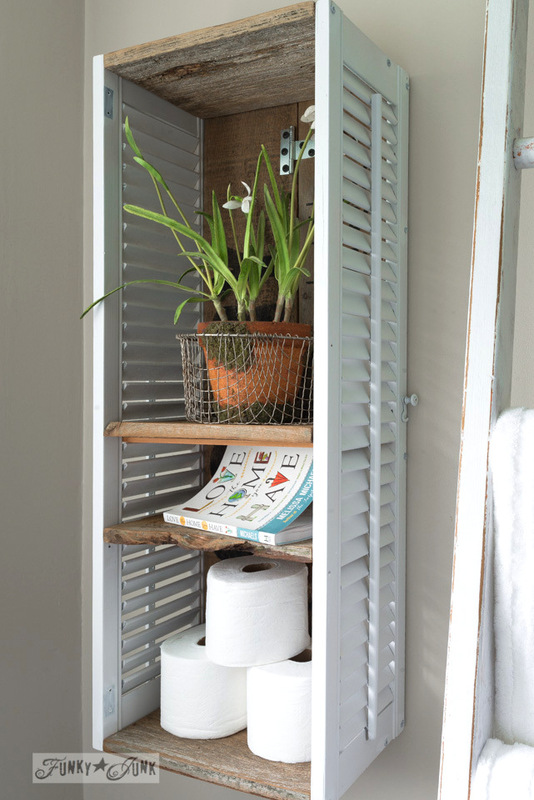 Your shutter shelf is charming in your bath room. And this topic of “Love the Home You Have” is very near and dear to my heart right now. I live on the family farm and just moving a piece of furniture can open a huge debate. Thinking about ways to make the space more enjoyable to me. 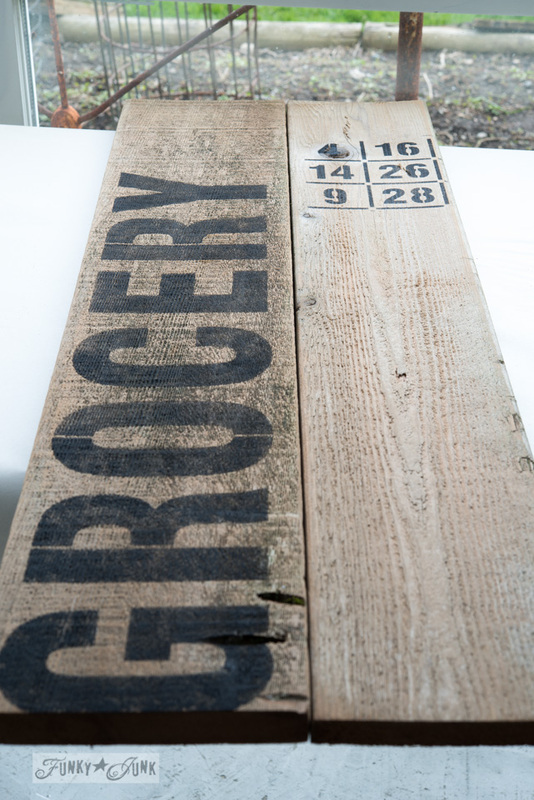 What a great idea using the cedar slats as shelf supports! I’m going to have to buy a copy of Melissa’s book. It might help to soothe my “wish we would have bought a different house” inside voice (LOL). How adorable is that? I always love your style, Donna, and your can do attitude is inspiring! Thank you for being a part of this special day and challenging us all to do more with what we have! I have followed blogs where I felt that the homeowner didn’t like where they lived, and it showed. I pictured this one in particular always pawing through her stuff, constantly changing the same space over and over again in rapid succession. I wondered if she was trying to dream up stuff to do just to have something to show on her blog. It was like she was talking and talking but didn’t have anything to say. She couldn’t give it a rest, so I stopped following. I think it shows when bloggers don’t appreciate their space. They complain. I can appreciate when a blogger presents a “problem” area, and I can appreciate them while they try to find a solution, but I don’t want to see them always unhappy with the choices they have made. It gets old after awhile. I love quick, little projects. I also enjoy the big, drawn out projects that show a process. I eventually see the end result. I also like seeing people’s stuff. And, how they use it. 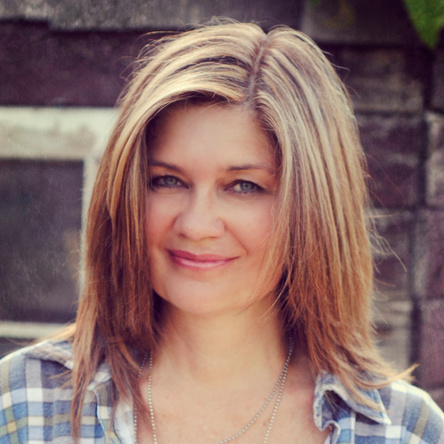 Oh Donna, I am sooooo happy for you that you have decided to love the home you’re with (yes, I audaciously ripped off the Stephen Stills song and I’ll make no apologies…hehe!). Really, from what I’ve seen of your home, it very much IS a dream home and I know it has the potential to be *your* dream home with a little bit of ingenuity and a lot of work and I know you are up to the challenge! 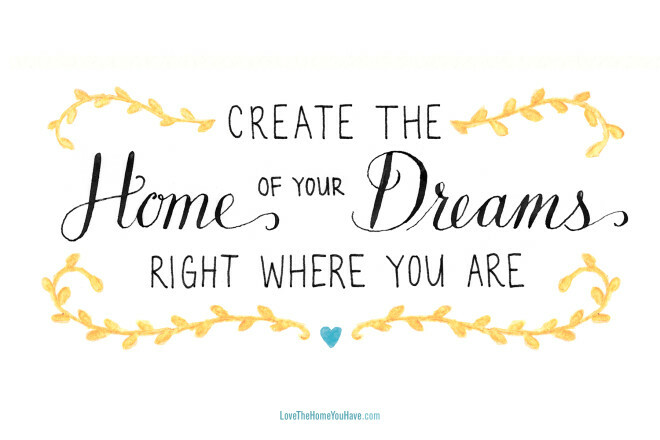 I am hoping that your decision to turn your house into your dream home will inspire me to do the same. My biggest strike against our home is location, though, so that might be a toughie to get over. 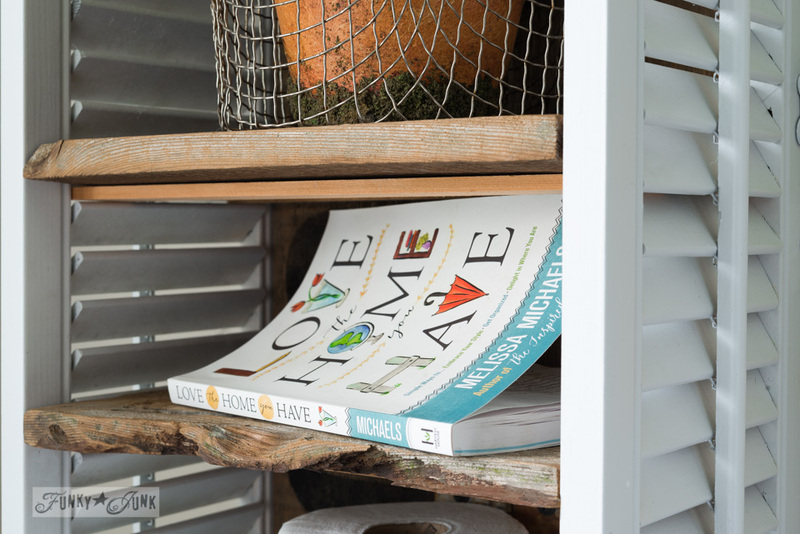 But I promise to follow the “Love Your Home” challenge, pick up the book, and try to ride off of the inspiration I get from your blog and that should help immensely! 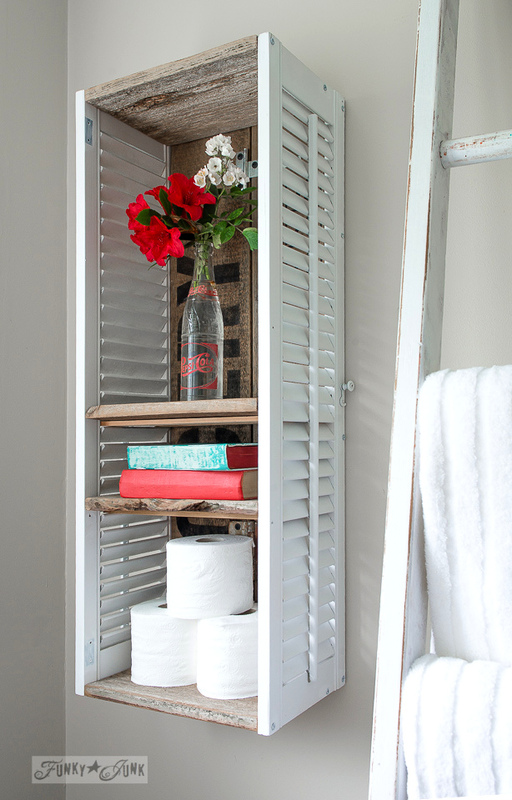 I really love your shutter shelf, too (try saying “shutter shelf”) 10 times fast)! 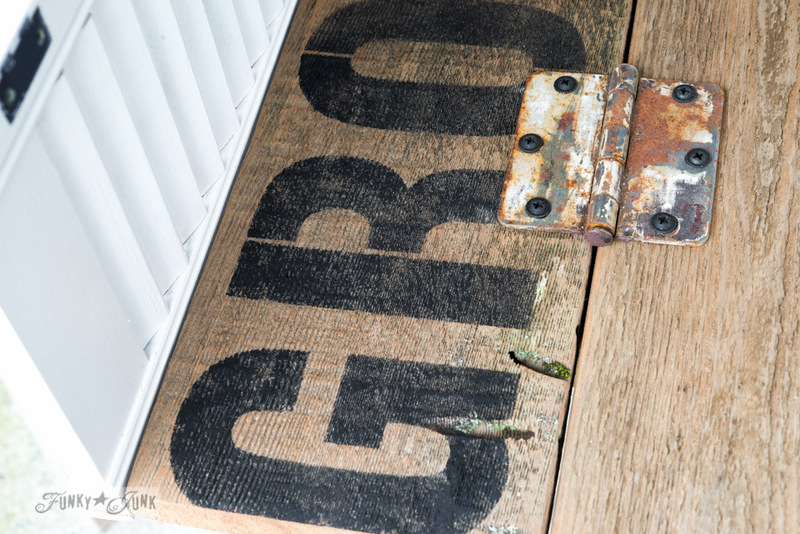 When we bought this home, they left some shutter-style closet doors in the shed…this sounds like the ideal project for them and, goodness knows, my little bathroom could use all the storage space it can get! Thank you so very much for always sharing your amazing ideas with us…as well as your daily struggles and the ways you overcome them…you are a great inspiration always…and I wish you all the very best in turning your house into your dream home! I love the old planks and shutters together. Turned out great! first off-what a great site with exceptional ideas. they are really up my ally as i have done this kind of recycling home decorating for so many years and have had to slow down due to physical limits but just makes me do smaller projects. Your shutter shelf i made one sort of like that but with the pickets that were falling off my backyard fence. reclaimed wood pickets on sides and back, shelves where made of the pieces cut down and my sister loved it so much i gave it to her. I also used the pickets for shelves above my large kitchen window and filled it with little chochkies.I built a bunk for my son, in his room there was part of the ceiling slanted which cut the room size some so i found an old box spring thing that you use in place of a box spring, attached it to the wall and a few 2×4’s, ladder and made a curtain with excess of jean material and snaps to surround the base for a play area or desk. he loved the bed high enough to be away from his little brother. it was so long ago, i never took pictures but wish i had. Trying to change to fit what you think will make things better, may not always be the best choice. As Melissa stated “you gain some and you loose some.” You have transitioned so many things in your home yourself and created a wonderful home that fits you and your son. Your bath is a great example, you made it your own design and it looks great. Even though your mind may be telling you the farm is a really good choice…the home you have is great.